On 1st July 1915 the 'Societa Stabilimenti Metallurgici e Fonderie Metalli' was founded by Francesco De Benedetti at Turin in order to produce aluminium products. This became the 'Fonderie Officine De Benedetti' (or FOD) on 1st January 1919 (it later became 'Societa Aninima Fonderie Officine De Benedetti - Fabbrica Vetturette FOD' in 1925). 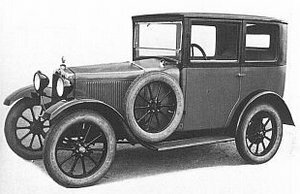 Having worked with the automotive industry developing and producing various components in aluminum for many years, in the early 1920s De Benedetti began development of his own car. Finally entering in production in 1924, the car used an innovative single-piece, cast aluminum alloy frame with steel reinforced aluminum chassis (resulting in a low weight of 420kg), a 565cc four-cylinder side-valve in-line engine (producing 18bhp) with a single overhead camshaft and a three-speed gearbox. As could be expected coming from such a company, aluminum was used everywhere, including the wheel, pistons, cylinder head, exhaust manifold and all pipes, tubes, handles, brackets, etc.. Drum brakes were fitted at the rear, operated by the brake pedal, whilst the handbrake operated on the transmission. Versions available were a two seater torpedo, two seater berlina, three-seater berlina, spider, a small van with a 150kg payload constructed on a longer chassis and a 'Sport' version was also built, which competed with some success in a variety of competitions. The wheelbase was 2150mm whilst front and rear tracks were both 1110mm. 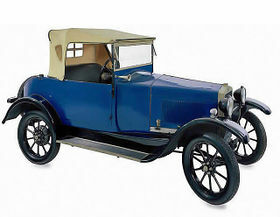 An initial series of 500 vehicles was completed in 1926 and a joint venture was then undertaken with SAM. The latter were to assemble and finish the cars produced by FOD, the aim being to drastically increase the production capacity to around 25-30 cars per day. Unfortunately, as with so many other small companies of the time, the recession bit and in March 1927 FOD ceased to trade.